Spiritual support, social engagement, and care for the environment. These are ways we help. Practicing Buddha’s teachings and sharing them with others are the main ways we help. How? The Abbey responds to reports of mass shootings, suffering refugees, terrorism, and more by teaching compassion, tolerance, fortitude, and wisdom. People are thirsty for the Buddha’s teachings and we are glad to share. The Abbey’s broadest outreach is through YouTube. Some teachings are translated and posted in Russian, Spanish, German, and Chinese. And of course, we support people through courses at the Abbey and teachings wherever we travel. Of critical importance, we talk about how to incorporate responses to disturbing world events into our Dharma practice. We also support Ven. 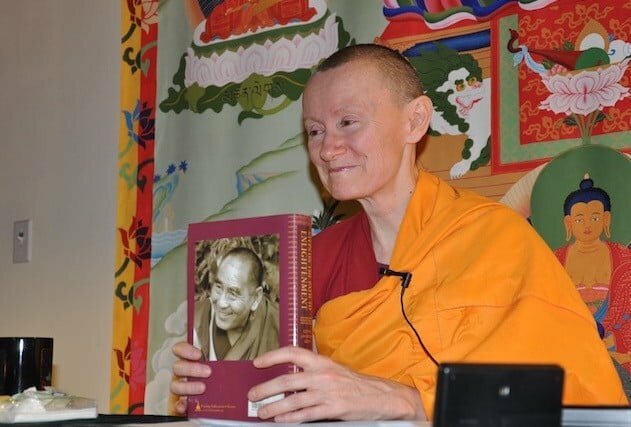 Thubten Chodron to write books that are translated into many languages and read around the world. The community dedicates our virtue every day for all sentient beings, including our benefactors who enable our practice. We especially dedicate for recent donors at our bi-monthly Lama Chopa pujas. Many people write or call to request prayers, especially at times of illness or death. You can also mark life transitions—childbirth, graduation, marriage, or death—by requesting special practices or pujas and dedicating the merit for the well-being of yourself or your loved ones. You could request Lama Chopa puja or a meditation on Tara, Chenrezig, or Medicine Buddha. If you aren’t familiar with these, we can help you decide which is most appropriate. Traditionally, at the time of the request, people make an offering to the monastery to generate merit on behalf of your loved one. You can write you own dedication prayers if you wish. Use the message section of the Donate page or write the office. By request, the community dedicates merit for the good rebirths of people who have passed. We also offer spiritual counseling, especially for people who are Buddhist. There are many good resources for how to work with your own terminal diagnosis or the death of a loved one in the Death and Caring for the Dying section of ThubtenChodron.org. You can download Buddhist mantras to support the dying. Also see video playlists on Impermanence, Aging, & Death and Grief & Loss. In addition, we offer a place where friends and family can spread the cremation ashes of your dear ones, and we will support you in this ritual. Write to the office to make a request. Interdependence, protecting life, and loving kindness are three of the Buddha’s most important teachings. Sentient beings and the environment depend upon each other for survival. Thus it’s in the interest of human beings to help one another and protect the environment. We integrate Buddha’s teachings by carefully stewarding the monastery’s 300 acres of forest and meadows and the animals that live there. 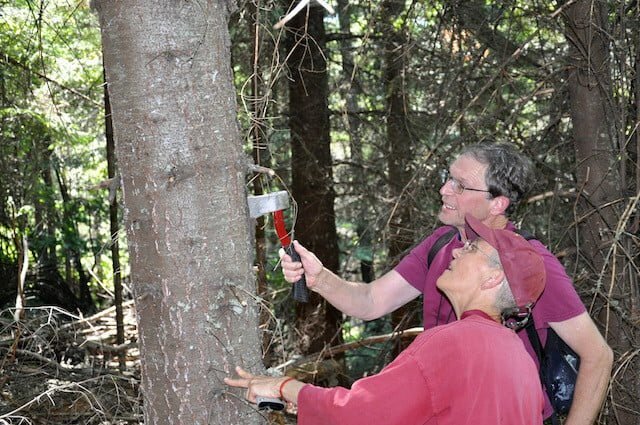 In association with the Federal Forest Land Enhancement Program (FLEP), we thin and clean up over-crowded and diseased areas of the forest to promote its health and prevent wildfires. We welcome WWOOFers and others who would like to help. See the Volunteer page. We also attend local hearings and rallies and write letters as appropriate. Through forest stewardship training, we continue to educate ourselves as we live simply and mindfully to reduce our carbon footprint. Traditionally, Buddhists advocate nonvio­lence and the protection of life. As we are concerned with welfare of all living beings, we take our meditation practice into the world by sharing these values and serving others. 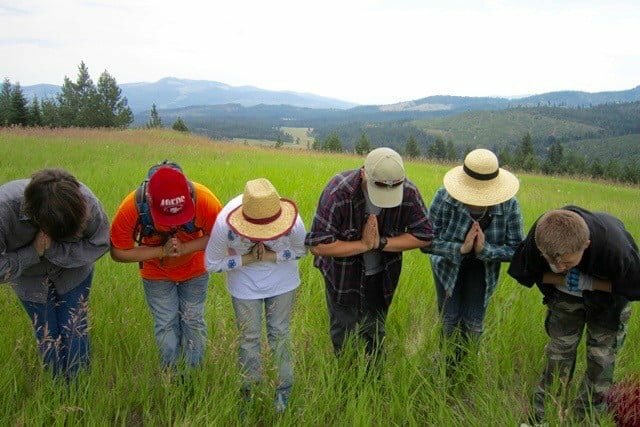 The Abbey’s social engagement is most focused on the Prison Dharma Outreach program, through our involvement with local homeless and at-risk teens, and through active Interfaith Exchange. With over 900 incarcerated persons on our mailing list, we provide Dharma books, videos, personal instruction, and spiritual counseling to incarcerated persons who are interested in or are practicing Buddhism inside prison walls. On average, 200 inmates join the Abbey’s annual Retreat from Afar, committing to at least one daily session of the retreat’s practice and receiving weekly transcripts of related teachings. Nearly 1000 prisoners receive the quarterly Dharma Dispatch, a newsletter filled with guidance from well-known Dharma teachers. We publish contemplative writings, poetry, and drawings of inmate as well. Abbey monastics make prison visits when possible, giving teachings, offering counseling, and volunteering at our local Airway Heights state prison. It is surprising that, out of gratitude and despite their tough economic circumstances, many incarcerated persons send offerings in the form of financial gifts, beautiful art, or poetry in appreciation of the spiritual support they receive. Read Ven. Jigme’s reflection on her experience at Buddha Day at Coyote Ridge Correctional Center. Here is Ven. Chonyi’s reflection on visiting McNeil Island. Read all Prison Program posts. His Holiness the Dalai Lama lists cultivating harmony among the world’s religions as one of his top three priorities. Ven. 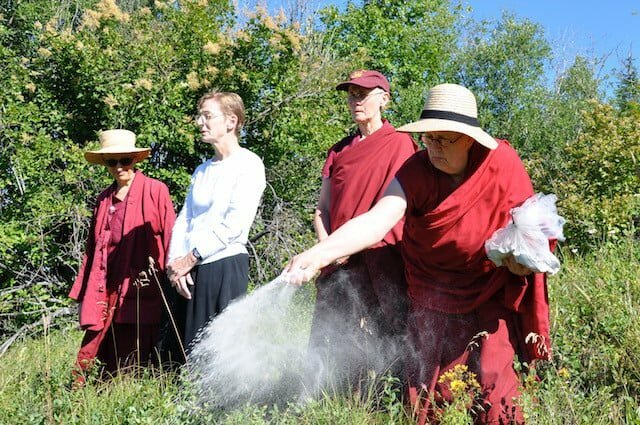 Thubten Chodron and the Sravasti Abbey community engage in interfaith activities whenever possible. We believe this is especially important in a time of heightened misunderstanding about Islam and the threats against Muslims. Interreligious dialogue helps us to approach people of different faiths—or no particular faith—with an open mind, respect, and willingness to learn. Through such conversations, we become more open-minded and our abilities to investigate and examine our own beliefs and ourselves sharpen. While there are philosophical differences between religions, we can recognize those and still appreciate the similarities. All spiritually-oriented people admire the qualities of love, compassion, wisdom, generosity, and ethical behavior that is based on non-harmfulness. When we meet each other in the spirit of these shared values, we increase understanding, encourage harmony among the followers of various faiths, and contribute to creating peace throughout our chaotic world. Our rural county has an astonishing number of homeless, runaway, or at risk youth. Youth Emergency Services addresses the needs of these young people, serving around 150-200 teens every month. Vens. Chodron & Jigme serve on the board of directors, while other Abbey residents volunteer as their skills are needed. A common misconception holds that these young people are delinquents, using drugs, and dropouts. In fact, they are frequently escaping a home life of substance abuse and are trying to stay in school. Some parents are absent, deceased, or incarcerated. Sometimes our young teens have left neglectful or abusive situations fearful for their safety. 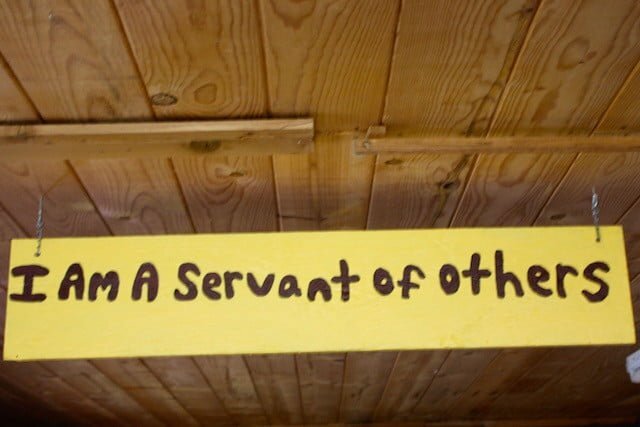 Often they do not receive the care they need, whether physical, medical, or emotional. In addition to board guidance, the Abbey helps introduce Y.E.S. to our Dharma friends and students outside the area who have resources and interest to help.